It comes as a surprise to many people that not all Collies look like Lassie. Collies come in two varieties, Rough and Smooth, and each variety may be one of three colors. Rough Collies have a flowing, abundant outer coat and a very soft, furry and tightly packed inner coat. The coat is very abundant on the mane and frill and the front legs are heavily feathered. 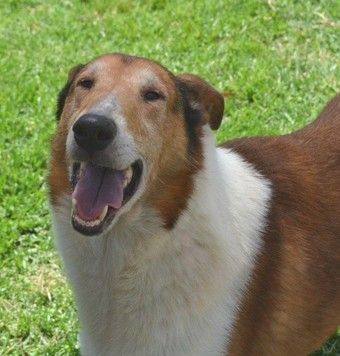 The Smooth Collie is identical in conformation to the Rough, but its outer coat is short, hard, dense and flat. The three recognized colors are Sable and White, Tricolour and Blue Merle. The Sable and White is predominately sable with white markings on the chest, neck, legs, feet and the tip of the tail. The Tricolour is predominately black, with similar white markings to the Sable and tan shadings on the head and legs. The Blue Merle is a marble color, predominately blue-gray and black, with white markings as in the Sable and tan shadings as in the Tricolour.